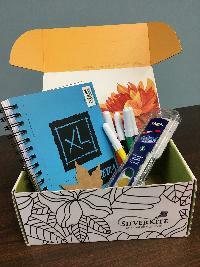 Prize: Just in time for the holidays, Silver Kite Community Arts is giving away a SPARK Box. SPARK Boxes are arts engagement toolkits designed to spark creativity and connection. Filled with arts supplies, an instruction booklet, and a journal. What you must do to enter: Fill out an entry form with your first and last names, location and email address.